The WAE1111.Ft6004 TAG Heuer Golf Watch Men’s Watch is the place where elegant meets sporty. This watch is casual, with an edge of sophistication and class. It comes in either a black or white version…of course, I prefer the black. 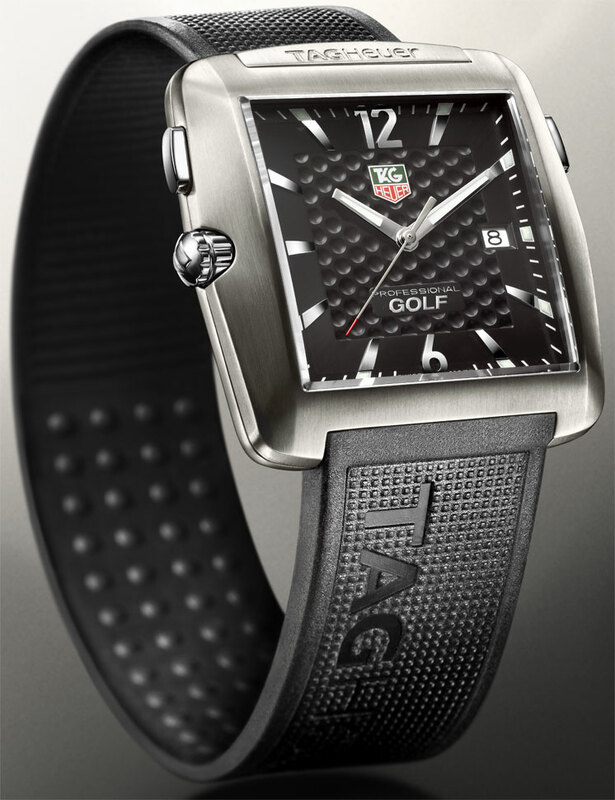 The WAE1111.Ft6004 TAG Heuer Golf Watch Men’s Watch has a practical and quite functional design. Hailed as the first watch ever made for professional golfers, the WAE1111.Ft6004 TAG Heuer Golf Watch has been created with the needs of golfer’s top of mind, right down to a ergonomically designed fit. With the help of professional golfer, Tiger Woods, the WAE1111.Ft6004 TAG Heuer Golf Watch may just change you thoughts on sport watches. The WAE1111.Ft6004 TAG Heuer Golf Watch men’s watch is a Swiss Quartz timepiece, with a RONDA 1005 precision movement. It offers exceptional readability is all conditions, with its scratch resistant, anti reflective coated sapphire crystal. This is a professional watch, with hour, minute, and second hand functions. The case is crafted with a combination of stainless-steel and brushed Titanium. The case on the WAE1111.Ft6004 TAG Heuer Golf Watch is slim and sleek, measuring just 10.5 mm in thickness. The strap is made from a silicon material, which is strong and durable. What makes the WAE1111.Ft6004 TAG Heuer Golf Watch really tick is the fit. The comfort level on this watch is off the charts. A golfer wants nothing standing in between him and his swing…the TAG Heuer Golf Watch dosen’t. I love the style of this watch and it keeps perfect time as long as I don’t try to wear it. Once on my wrist it has an aversion to keeping time. I’ve returned this watch 4 times to Tag Heuer in NJ without any resolution to the problem. Tag Heuer has refused to replace this watch. So, if you don’t require a watch to keep proper time, buy this watch. If you find it unacceptable that a watch that loses 7 minute time in less than 12 hours like mine did the day it was returned again from Tag Heuer, don’t buy this watch.